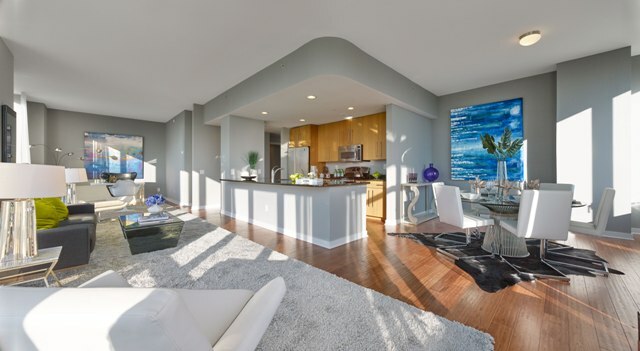 PALISADES PARK, NJ – All the elements that make condominium living so desired are on full display at Trio in Palisades Park, where the debut of a spectacular new professionally-decorated Penthouse model has spurred significant buyer interest. Located on the top floor of one of the two mirroring nine-story buildings, the stunning two-bedroom home has drawn large crowds eager to experience the well-appointed and spacious interior layout, incredible views of the New York City skyline and the nearby George Washington Bridge for themselves. Additionally, people are excited to learn more about the ease and convenience of maintenance-free living at Trio. The Penthouse homes at Trio have claimed their share of the spotlight at the Bergen County high-rise building with astute homebuyers touting the unique opportunity to live in a striking new residence in a signature residential building at prices starting from just $595,000. Better yet, a special limited time incentive provides up to $50,000 off the purchase price of two- and three-bedroom Penthouse homes. Four different Penthouse floorplans are now available at Trio with upscale elements such as separate kitchen and dining areas, two-and-a-half to three bathrooms, spacious master bedroom suites with walk-in closets, designer kitchens and more. Some of the Penthouses offer spectacular New York City views, while others offer spanning vistas of the western-facing landscape. In addition to the new Penthouse model, MWHF Palisades Park, LLC, developer of Trio, has also debuted a newly decorated two-bedroom model home. The residence spotlights the popular 02 condominium line which boasts two full baths, master bedroom suite with walk-in closet, state-of-the-art kitchen with breakfast bar and expansive living and dining areas.